Posted in: Insects, Leaves, nature, outdoors, Photography, Plants, Spiders. Tagged: animals, insect, Nature, outdoors, photo, Photography, picture, spider, sunset, Wildlife. 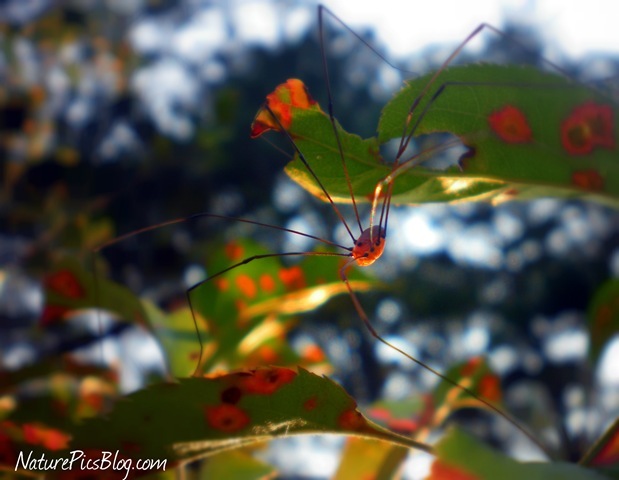 The sun was just beginning to set when I photographed this granddaddy longlegs spider sitting in our apple tree. It made him look so colorful and brilliant. He was hard to see because he blended in so well with the leaves and bark of the tree.